Following my successful experiment with pistachio kulfi I started thinking about the world of possibilities for Indian ice cream. I considered turning my hand to hazelnut (too similar to pistachio) or lemon (no lemons at home) and finally settled on raspberry - primarily because I had a spare punnet in the fridge. Not only does it look pretty, it tastes fantastic - I hope you give it a whirl. Using a wooden spoon press the raspberries through the sieve over a suitable bowl. Scrape underneath the sieve so that nothing is wasted. Now add the condensed milk, and vanilla extract to the bowl and stir well. In a separate bowl, beat the whipping cream until it forms stiff peaks. Take care not to over beat the cream. Fold the cream into the condensed milk mixture until it is thoroughly mixed in. Pour into a mould (or several moulds) of your choice (I used an empty cream cheese tub) and place in the freezer until completely frozen - in the region of 8 hours. Prior to serving, remove from the freezer. Run hot (not boiling) water over the back of the mould and then empty the kulfi onto your serving plate. Garnish with the remaining raspberries and leave to soften prior to serving. Depending on the temperature of the room this can take anywhere from 5 to 40 minutes. Looks brilliant - ideal for all the raspberries in my garden right now! I've got a fridge full of whipping cream to do my daring bakers' recipe but I might make this instead now! soo pretty reena..and waaay too easy to pass really! 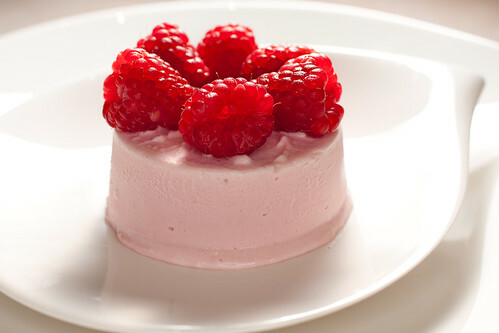 Reena the raspberry ice cream looks amazing. So smooth! And the recipe so simple. This weekend I'm making Lamb and Spinach curry with a lemon rice. I thought this would go perfectly to end the meal. The entire meal came out beautifully. And the Raspberry Kulfi was the perfect ending. I'm wondering if it could be made in ice lolly moulds. Raspberry Kulfi on the go.....Thanks for the recipe. I will certainly be making these again, and I'm now looking forward to making more of your recipes. Glad to hear that the meal and kulfi came out well. I'm positive you could make the kulfi in ice lolly moulds. Brilliant, I've just bought some little umbrella moulds recently so i will make them in those. Your recipe was a major hit at an Indian food gathering the other night. I like it so much that I have posted the recipe on my blog and gave reference to you. Please hop over and visit at http://www.healingwoman.blogspot.com and thank you so very much for sharing this wonderful recipe!